Sony/Columbia are under pressure to get a sequel to Ghost Rider in production by November or they face the consequence of losing the rights. The rights would of course lapse back to Marvel (where they belong). Under this gun, Sony/Columbia are in early negotiations with the controversial Crank directors Mark Neveldine and Brian Taylor. I say controversial because for most Neveldine and Taylor are a questionable choice. More simply, there are a lot of people who hate them. I'm not one of them, I actually really like their filmography (at least what I've seen). 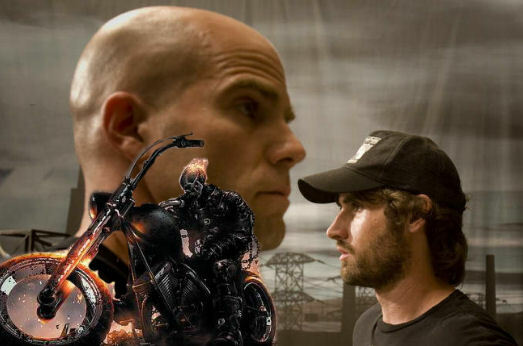 Neveldine and Taylor could really bring something special to the Ghost Rider franchise. Not to mention I'd love to see Nicolas Cage under their direction. As previously reported, "Ghost Rider: Spirit of Vengeance" is penned by David Goyer, set in New Orleans and takes place eight years after the events of the first film. Outside of that much of the storyline to the script is being kept under wraps. Goyer has said that the film is more stripped down and a bit more darker than the previous attempt. Goyer's script was originally intended to be a R rated film, but recent word has it that Sony/Columbia wants a PG13. There is also the possibility that Mark Neveldine and Brian Taylor could take a stab at the script, but with the rights timetable in their path, I seriously doubt they'll do too much re-writes.